Music for Mass in the Extraordinary Form on the fourth Sunday of each month Mass is fully sung by the Schola Gregoriana Malverniensis, which also occasionally sings Mass on other major occasions even when they do not fall on a fourth Sunday. The Schola Gregoriana Malverniensis comprises a small group of dedicated amateur singers who practise weekly near Malvern, Worcestershire. 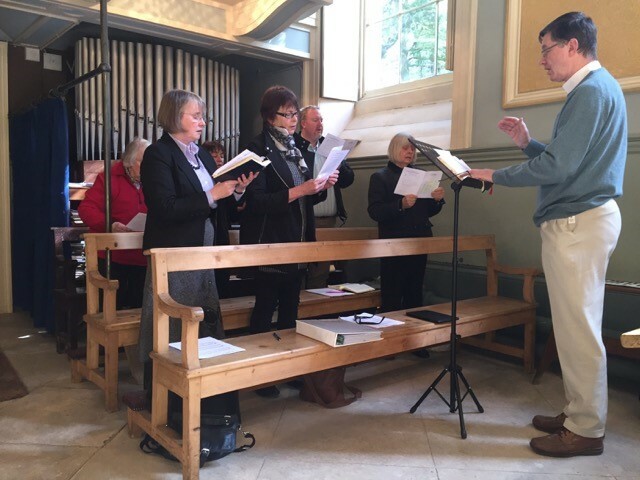 Music for Mass in the Extraordinary Form on the second Sunday of each month is provided by the Schola Parva, a smaller Schola which sings simpler settings of the Ordinary and the Propers of the Mass. The Schola Parva only rehearses immediately before Mass on singing Sundays. The proposed musical Order of Service for each Sunday is to be found in the Mass listing page. The website Sancta Missa provides a comprehensive guide on Sacred Music for the Liturgy in the Extraordinary Form. Information about Gregorian Chant Scholas elsewhere in the United Kingdom can be found on the Gregorian Chant Network's website which includes a map providing a summary of Scholas - including the Schola Gregoriana Malverniensis - which are affiliated to the Gregorian Chant Network. Details of the 1870 Nicholson pipe organ, located at the back of the church in a loft above the west door, can be found on a separate page.